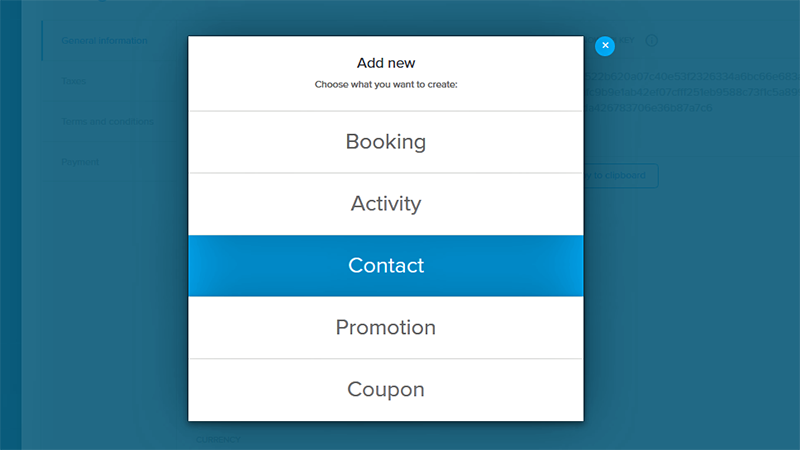 Someone books your tour through the booking button on your website. Your customers need to leave contact information in order to make a booking. You manually create a booking in the Orioly app. In the process, you also need to enter the payer information. If the person’s already in the Orioly database, it will automatically suggest his/her contact details based on the first letters you type. 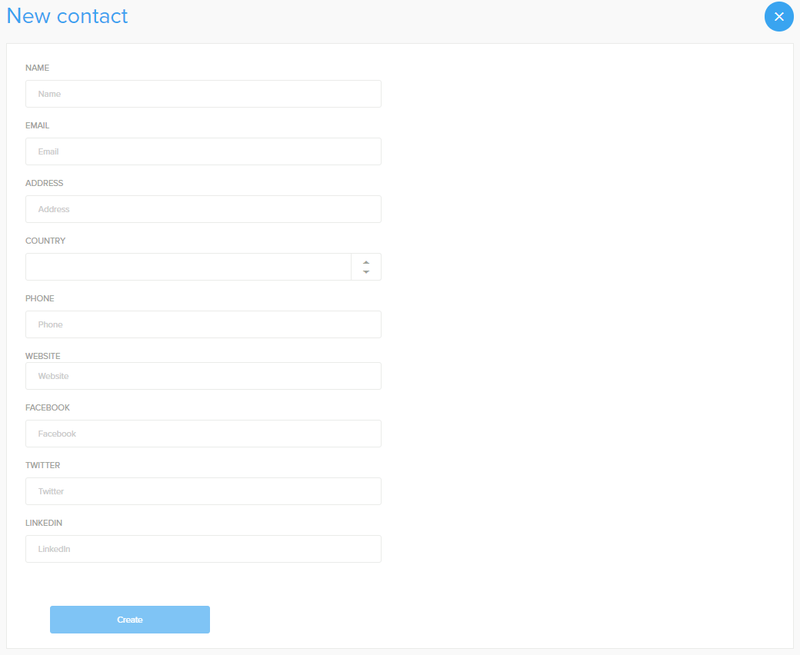 You manually create a contact in the Orioly app. Click Add new from the sidebar, then click Contact. Name – enter the first and last name of your new customer. Email – enter the new customer’s email. Address – enter the new customer’s street name and town. Country – click the side errors and choose the country the new customer comes from. Phone – enter the phone number you can use to reach your new customer. Website – enter the website address of your new customer if he/she has one important to you. Facebook – enter the URL link of your new customer’s Facebook profile if he/she has one. Twitter – enter the URL link of your new customer’s Twitter profile if he/she has one. LinkedIn – enter the URL link of your new customer’s Linkedin profile if he/she has one. Info – this field will fill out itself once a booking is created for this person. It will be updated with each new booking this person makes. Pending – customer created a quote, but still didn’t pay for anything. Deposit – customer paid a partial amount. Paid – customer paid the whole amount. Contact name, address and payment status – When there is no information on the payment status, it usually means someone else paid for this customers. 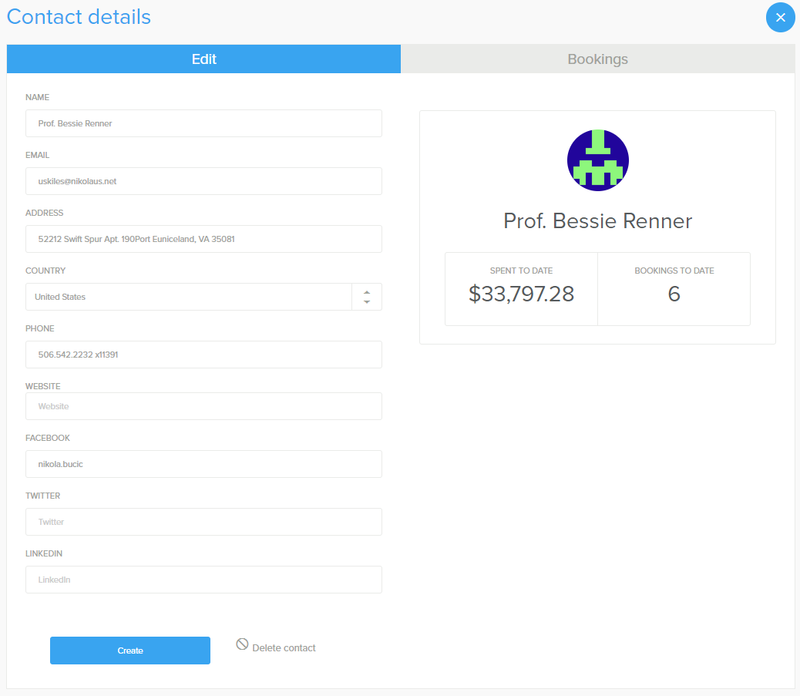 Bookings (payer/traveler) – It shows the number of bookings the person paid for, versus the number of times the customer was only taking a tour. 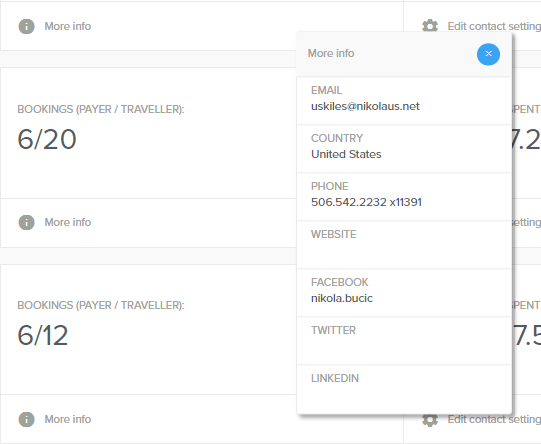 Click the gray info button to view client’s email, country, phone number, and social media profiles. Total amount spent – This option lists all payments for a certain customer. Here’s a short video on how to manage customer info and contacts.